Sometimes you may need additional data displays so that for example weather readings can be seen in two different rooms. 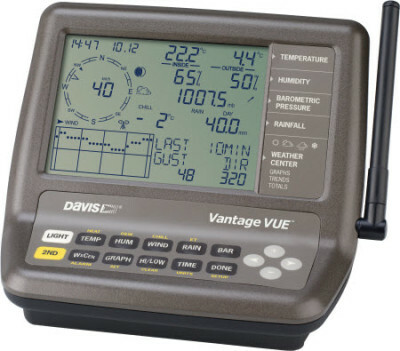 Of course, if the Weatherlink data logger is installed then the PC display, which doesn’t necessarily need to be in the same place as the VP2 console, can effectively function as a repeater display. And a large monitor or screen can act as an impressive secondary display for public areas. (Read more about PC-based repeater displays.) But often a smaller, always-on display will be preferred, for which Davis provide two options: a second VP2 main console or a Vantage Vue console. Note that both of these are wireless-only options – it is not straightforward to add secondary displays (other than those linked to a PC) to cabled VP2 stations. In both cases, all the usual comments for ensuring good wireless reception will apply equally to the secondary console; in other words it will need to be in good wireless range of either the primary transmitter(s) or of rebroadcast signal from the primary console. A further option is to buy an Envoy console as an additional unit. The Envoy has exactly the same functions as the standard VP2 console but has no display. 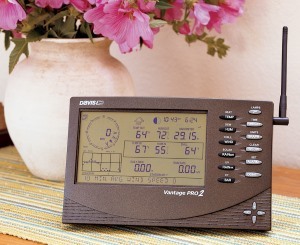 It must therefore always be used with a Weatherlink logger fitted (not supplied) in order to relay data to a computer for processing. The Envoy can be a useful unit when used simply to feed data to a PC, thereby releasing the main display console (perhaps the original console in the main station) for a more flexible role. Wireless repeaters extend the range possible between primary transmitter (eg the ISS unit) and the main VP2 console, by receiving the wireless data and retransmitting again at full power and thereby acting as a staging post for the signal. Each repeater can extend range by 200-250m in clear line-of-sight conditions and repeaters may be daisy-chained to cover longer distances. Repeaters can be useful not only for extending range, but for taking the signal around an object such as a building which would otherwise be in the direct signal path between ISS and console and otherwise preventing good reception. One repeater is able to handle signals from multiple transmitters, including supplementary stations, on different channels. 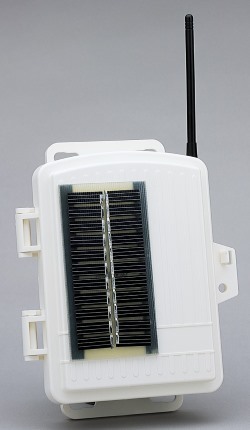 Davis have now limited the repeater range to two models: 7627 (pictured above) is the standard-range solar-powered variant and will operate in a completely isolated location, while 7654 (see below) is the long-range version. Both 7627 and 7654 can also be powered from a standard Davis 6625 mains adapter, for applications where an AC mains supply may be close at hand. The 7654 wireless repeater is the long-range (LR) version. 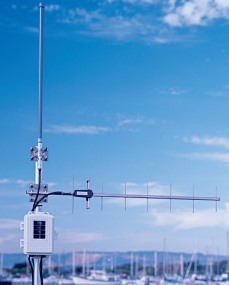 Instead of having a single whip antenna (as in the standard repeaters) the LR repeaters have two separate internal connectors – one for receive and one for retransmit – intended for linking to external antennas (which must be specified and purchased separately). Because these add-on antennas can have much higher gain than the standard whip they offer the possibility of much longer range in a single hop. With two high-gain antennas fitted, a range of up to 1km or potentially even more can be achieved, provided line-of-sight for each leg of the signal path is maintained. We supply two main types of antenna: an omni-directional (‘omni’) antenna and a higher-gain but directional Yagi version. If you’re thinking of using an LR repeater then please contact us for further discussion to help specify exactly which antenna combinations you may require. In 2013 Davis released a new range of weather-resistant shelters and associated solar power kits, which supersedes the previous range of shelters (parts 7724 and 7728) and 7707 solar power supply. The new range brings two big benefits: first, the shelters are a completely new design specially tailored to the current Davis VP2 and Vue console models; and, second, the new range offer substantially lower prices than the outgoing models! 6612 Heavy Duty Solar Power Kit: contains a 6v 12Ah lead-acid battery and regulator. 6614 Solar Power Kit: contains a 6v 1.5Ah lead-acid battery and regulator. These solar power units are designed for use at unattended remote sites where there is no mains power and it’s impracticable or undesirable to visit the site often to replace batteries. At such sites, the console unit can be placed inside one of the above shelters and powered long-term from the solar power supply. The 6614 Solar PSU with its smaller, thinner, horizontal battery pack will accommodate any Davis console (VP2, Envoy or Vue) inside the same shelter as the solar PSU, so allowing a very neat and cost-effective solution. The larger size of the 12Ah battery in the 6612 Heavy Duty Solar PSU means that only the smaller Envoy (or Envoy8X) console unit can be accommodated within the 6612 shelter along with the battery. However, use of an Envoy unit will often be perfectly satisfactory at a remote site. 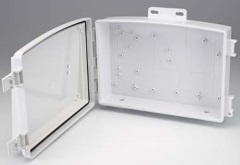 Vue and standard VP2 consoles can certainly be used with the 6612 Heavy Duty Solar PSU but will require to be mounted in a separate 6618 shelter (see above). Please see the 6612/6614 Instruction manual for further details of how the consoles are mounted. Vantage Pro stations are supplied complete with fixings to attach the outside sensors either to any tubular mast of 32-44mm diameter or to any screwable flat surface such as a wooden post. But there may be circumstances where no suitable fixing point is available. Davis offer two accessories to help out here. 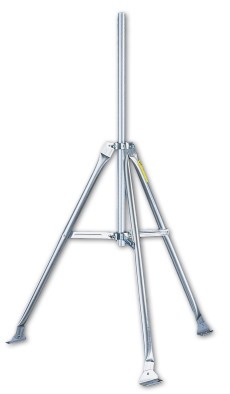 One is a sturdy galvanised tripod (7716 – shown right ) carrying a central mast reaching up to 2.1m (7′) in height, which forms an ideal mounting point for the ISS unit and/or for attaching a further extension pole, for example to carry the anemometer. It is also possible, for example, to replace the supplied central pole with a longer pole, sourced separately, to achieve a height of about 3.5m. Notice the horizontal brackets on each tripod foot, which have pre-drilled holes, allowing the tripod to be fixed down to the ground or some other material. One suggestion is to make a ‘T’ of two substantial wooden sleepers; then two of the tripod feet will secure to the crossbar of the T while the third foot secures to the upright. It’s possible easily to make quite a sturdy structure on which to mount the weather station in this way. The second mounting accessory is a Mounting Pole Kit (7717), containing two pieces of galvanised tube which fit together to form a 3′ extension pole, plus mounting brackets to attach to some other structure such as a brick wall or a wooden fence post.